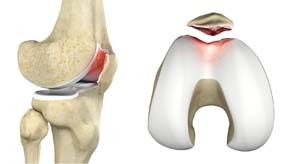 Chondromalacia patella is a common condition characterized by softening, weakening and damage of the patella cartilage. The condition is most often seen among young athletes and older adults who have arthritis of the knee. It is especially seen in women. Chondromalacia patella may also be caused due to injuries such as fractures or dislocations, or may develop as a part of the ageing process. Your doctor will conduct a physical examination by applying pressure on different areas of your knee and moving your leg in various positions. You may be asked to undergo imaging tests including an X-ray, CT scan and MRI scan to obtain detailed images of the bones and soft tissues of the knee. The Treatment of chondromalacia patella initially involves simple conservative procedures. You may be asked to rest your knee and avoid any activity that may strain the knee joint. Your doctor may prescribe painkillers and anti-inflammatory drugs to relieve pain and reduce swelling. Physical therapy may help you improve muscle strength, decrease stress on your knee and aid in correcting the misalignment. Wearing support braces and taping around the knee may help you protect your joint, reduce pain and improve alignment. Application of ice on the knee may be recommended after exercise.